Whenever I can, I stop at the Chevrerie de Combebelle, either with visiting family or friends, so they can see how the goats are kept and goat’s cheese made, or by myself, to stock up on some of their delicious cheeses. 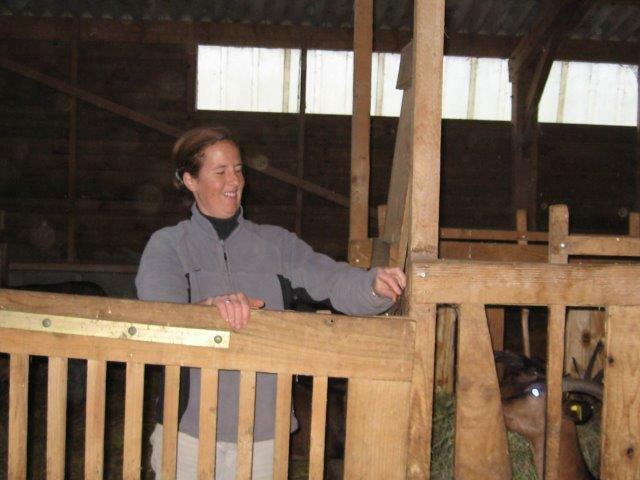 The goat farm was started by the parents of Anne Camelot, who runs the farm today with her husband, Heiner. When I first visited, many years ago, the milking parlour was still in the barn next to the farmhouse, and it was all very simple and rustic. Things moved up a notch when Anne and Heiner joined Anne’s parents: together they built a big new stable for the goats, which included a new milking parlour. The dairy was also given a makeover at that time. 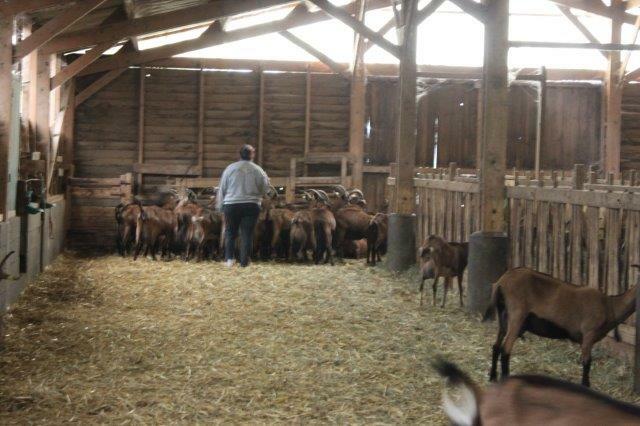 Over time the herd was extended; today it numbers 95 goats, not including the ram and this year’s babies. While I’m on the subject of baby goats, be warned if you ever get to see them in the flesh – they are so incredibly cute that you will want to take one home with you right away!! The little one above was only a few days old, but in the pen next door the others were several weeks old already, and they were having fun! Goats, contrary to sheep, are very curious and friendly creatures. Most of them will come and see you, say hello and allow you to stroke them between the horns!! 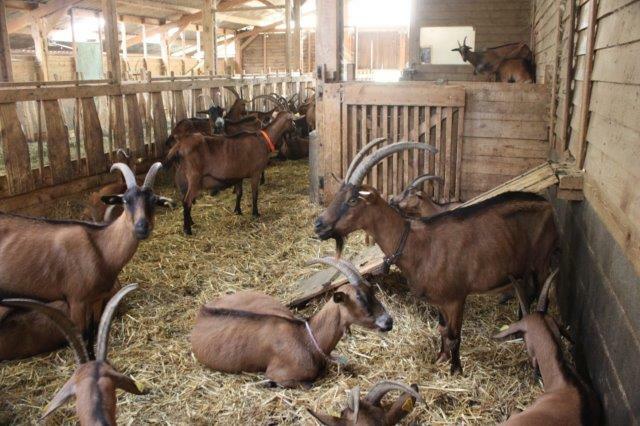 When I visited, the adult goats were just outside the doors to the stable, and some of them were already inside. It was close to milking time, and they probably wanted to be relieved of the heavy load some of them were carrying in their udders. Once all is ready, we move into the milking parlour next door. It’s a very simple but ingenious system. 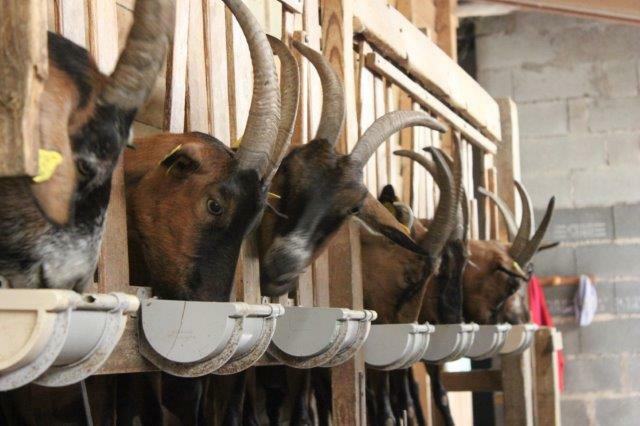 The goats climb up a ramp inside the stable, through a small door, and they enter into the milking parlour, on two walkways. 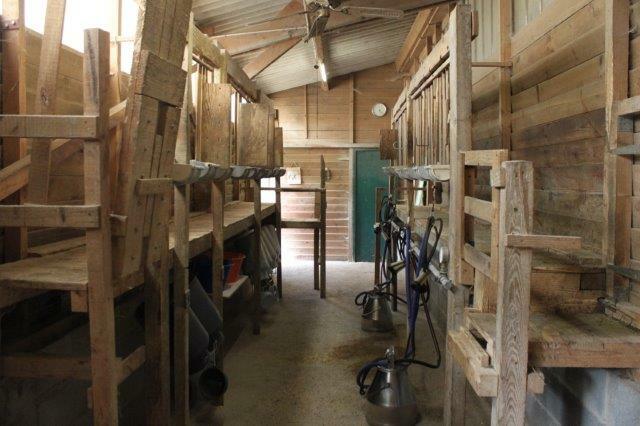 The walkways are just above waist height, so that attaching the milking machine and putting feed into the little troughs in front of each station is not back-breaking! There are drawbridges in between the two rows, and if you ever get to visit (which I would highly recommend that you do) you’ll see that it is incredibly orderly and organised. Here they come!! And as you see below, there’s always one who thinks that the grass is greener next door :)! Goats only have two teats on their udders – cows have four. The milking unit has two suction cups, and there are two milking units to each of the two machines. A goat will give approx. 2.5 litres of milk a day, being milked morning and evening. To give you an idea of how much milk is needed to make cheese, for the Ecu, the triangular-shaped cheese almost at the centre of the very first picture in this post, 1 litre of milk is required. 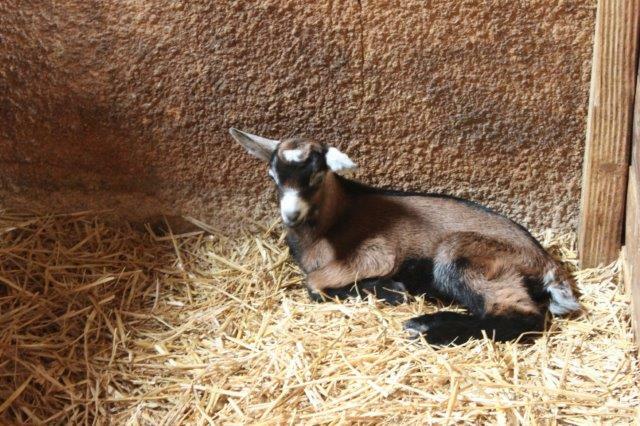 So on average, a goat gives enough milk each day for 2.5 Ecus. Once the milking is done, the goats exit through another small door, and down a ramp, into the stable. Does this look like fun?? When the milking is finished everyone is having a well-earned rest! The visit at the stables over, we headed to the dairy, where Anne Camelot welcomed us, to give us tastes of the cheeses. The dairy processes all the milk twice a day. Once the milk arrives from the milking parlour it is strained and then rennet is added to curdle the milk, which is then left to stand for the curds to form. 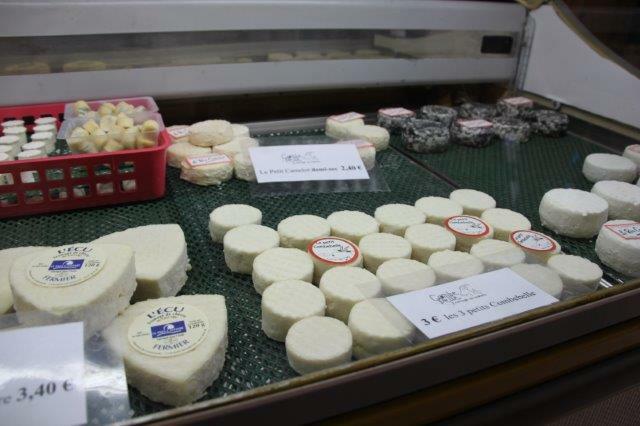 The curds are then ladled into individual draining baskets, which dictate the size and shape of the finished cheeses. On the picture above you can see the baskets for the regular round cheeses as well as for the bouchons, small cork sized cheeses which are perfect for aperitifs or salads. 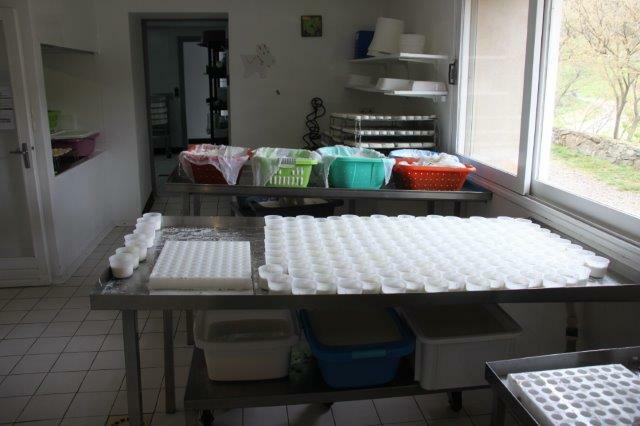 Once the cheeses have drained sufficiently, they are unmoulded and set on racks to drain further. These fresh goats cheeses are divine! They have a very “clean” taste, not at all reminiscent of goat. You can eat them with honey as dessert! The cheeses then go into the cold room for maturing and finishing. During the early stages they have to be turned very regularly. As the cheeses age the flavours develop and mature, and if you have a close look at the display cabinet you see fresh (1 – 2 days old), semi-fresh (1 – 2 weeks old), mature and very mature cheeses (older than 1 month). The cheeses shrink as they age, so the very mature cheese ends up being less than half the size of the very fresh cheese. 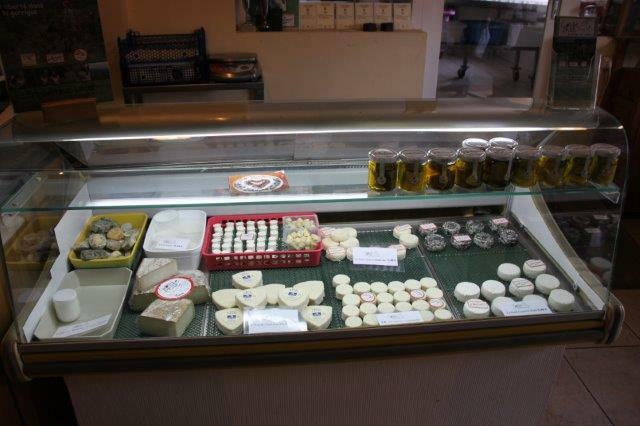 A few years ago Anne added two specialities to her range: goat yoghurt, and a cheese called Tomme de Chevre. The Tomme is a pressed cheese, with a firm texture, which matures beautifully. A special room was built for this type of cheese, created out of an old wine tank which was next to the dairy. So there you have it – our visit to see the goats has reached its end, but you are welcome to come back any time you like. The Chevrerie de Combebelle is open Tuesday to Sunday from February to the end of October, and milking usually takes place at 5.30pm. You can contact the farm on +33 467 380 538. The farm is located off the D20, between Villespassans and Bize Minervois; the signs are on the right approx 2.5km after leaving Villespassans. This entry was posted in Days out, Food, Places to visit, Uncategorized and tagged baby goats, combebelle, days out, goats cheese, languedoc, places to visit, tomme de chevre by midihideaways. Bookmark the permalink. I do love goats! And that cheese looks spectacular too. Great post. Thank you Jane, glad you enjoyed the post!! This is so cool. What a great post. It’s a true behind the scenes of goat cheese. This is so beautiful. Thank you. Hi Amanda, many thanks for your message! I’d never thought of it as “behind the scenes”, but of course it is!! Hi Peri, thanks so much – glad the post brought back childhood memories!! This is an excellent post — you’ve explained the process so clearly, and the photos are charming. Bravo!